Looking to do a run through on Professional, I think you would've had to beaten the game on Normal to access Professional but I could be wrong. I've nearly completed the campaign on Normal, but not quite. 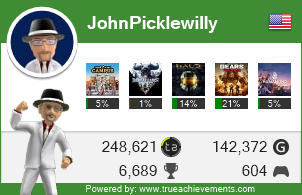 @JohnPicklewilly wrote: I've nearly completed the campaign on Normal, but not quite. Maybe that's something you and I could accomplish somewhat quickly. What stage are you on anyway? Stage? I'll have to pop that game in and see where I'm at. I took a look at my progress in the game. I misspoke in my earlier message. I should have said I nearly completed the game. Sadly, I haven't completed much of it on normal. I completed up to Chapter 6-3. However, the majority of my completion was done on the Amateur difficulty. I only completed a couple of chapters on Normal. So, you may want to find someone who has progressed through or most of the way through the game on Normal. @JohnPicklewilly wrote: I took a look at my progress in the game. I misspoke in my earlier message. I should have said I nearly completed the game. Sadly, I haven't completed much of it on normal. I completed up to Chapter 6-3. However, the majority of my completion was done on the Amateur difficulty. I only completed a couple of chapters on Normal. So, you may want to find someone who has progressed through or most of the way through the game on Normal. It's not really that big of a deal to be honest with you. I'm just looking to play it again and truthfully it's a fun game and I wouldn't mind rolling through it. It would actually be good because it would help me remember the storyline. I'm willing to do a run through with you. When would you like to start? @JohnPicklewilly wrote: I'm willing to do a run through with you. When would you like to start? We can plan it for whenever we are both online. Doesn't have to be a specific night. unless that works better for you. That will work. Whenever I get online, I'll look for you. Just figured I would use this as a tracker... we've completed Chapter 1 so next time we play we'll be going on Chapter 2-1. I had lots of fun! I LOVE co-op gaming! I'm looking forward to playing again. Made it through Chapter 2! Just goes to show how much I've been updating this @JohnPicklewilly. That's ok. I was having way too much fun listening to Chris. "C'mon Jill!" I felt like we made a ton of progress and even with the Quick Time Events we did pretty well. We're over halfway through Professional mode... I'm thinking we maybe need 2 more sessions. Depending if we're able to play this weekend or not, we should be able to finish up by the end of next week at the latest. By the way, I was researching the Who Do You Trust achievement. I found this note on one of the solutions: "You left out a big part of this solution. This has to be done with AI and cannot be accomplished while playing co-op." I'll get this one when I go after a few of the others. Now THAT is too funny! And here we were thinking something was wrong. Well, I figured we'd move on with this thread into the Lost In Nightmares DLC. From what I've seen it doesn't matter if we get hit but obviously the chances of us getting the achievement would be better. I think we have to get Wesker 4 times in a row while fighting him. And it mentioned on the video I saw that even if you don't dodge, your partner and you can still hit him after. But I don't think he can block otherwise the achievement won't pop. The professional playthrough doesn't look horrible.... just seems like something we'll have to not fight everything that comes our way. I figure the fight with Wesker might take us a few attempts but will still likely be less frustrating than the fight with Jill on professional difficulty. I'll be online this evening should you want to continue. I should be on, I'm just not sure at exactly what time I'll be on. If you aren't on when I get on, I'll text you. I just watched this video (see below) of this person running through Lost In Nightmare on Professional by himself. Most impressive! I don't want to know how many times he had to go through this to get this good at it.